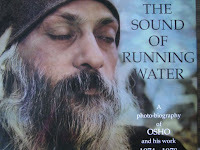 Many friends of Osho's will remember The Sound of Running Water, the beautiful, big photo biography that was produced in Poona One times. Many gorgeous photos of Osho, his people, and his ashram, plus numerous quotes tell the story of Osho's life and work between 1974 and 1978. The book was printed in a limited edition and went out of print more than 20 years ago when Avirbhava bought the last (signed) copy for $14,000 in Poona Two. Over the years, many sannyasins would sadly remember the time when they snapped up a copy for $100 in Rajneeshpuram – and gave it away. Sometimes a copy would appear on ebay or Amazon, offered for several thousand dollars. Now Swami Jagdish in Pune has reprinted the book, with the same photos and text, in almost the exact same format, and we have just received a small shipment. You can contact us at oshoviha@oshoviha.org if you would like a copy. This Very Place: The Lotus Paradise.) This new version has some additional chapters and covers Osho’s life and work from 1979 to 1990. Each book measures 12 1/2 by 11 inches. The Sound of Running Water weighs about 7.5 lbs, and The Song of the Ocean about 5.5 lbs. We are offering The Sound of Running Water for $895 and The Song of the Ocean for $595. I think the two books are must-haves for every lover of Osho. I'm glad to see the reprints of these two big photobiographies. That's good news. You left out the prices. Also, you left out the quality compared to the originals. Two very important factors for a prospective buyer. You say they are identical to the originals in terms of photos, text, and basic format. But what about the price and the quality? Did the guy in India just take an original book and copy it page for page at a New Delhi Kinko's, or what? Do they cost $10O, or $1,000? Also, the second book(1978-1984) was originally titled "This Very Place, The Lotus Paradise", not "The Lotus Paradise" as you have stated in your post. Though a small point maybe, it isn't if you are searching for a book -- as you know the correct title for alphabetizing and identifying purposes is quite important. I bought that book for $100 at the Ranch bookstore when it had just came out, and, yes, I gave it away too. To the Ranch as a gift, before I left once on a visit. It ended up on the RIMU countertop, I think, for anyone to look through. Keep up the great work Dhanyam and Avinasho, on providing the world with Osho's works! May the gods be with you. That's a great story about your leaving the Ranch! As you can see above I have added the price for the books now and corrected the original title of the second book. The Sound of Running Water is very close to identical to the original. I don't know how exactly Jagdish produced the book, but he did a high-quality job and certainly did not go to the local copy shop. The original This Very Place, The Lotus Paradise covered Osho's work from 1979 to 1984, with the emphasis on the Ranch. 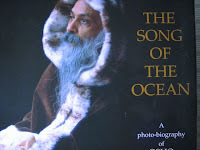 For The Song of the Ocean, the publisher has shortened the parts about Poona Two and the Ranch, and instead added chapters about Osho's arrest and deportation from the US, Osho's World Tour and return to India, his death and the evolution of his work since. I checked Amazon today and saw that the original Sound of Running Water is being offered for $1,995. That is amazing news! When will the books be available? Are they only available through you or will they sell in book stores?